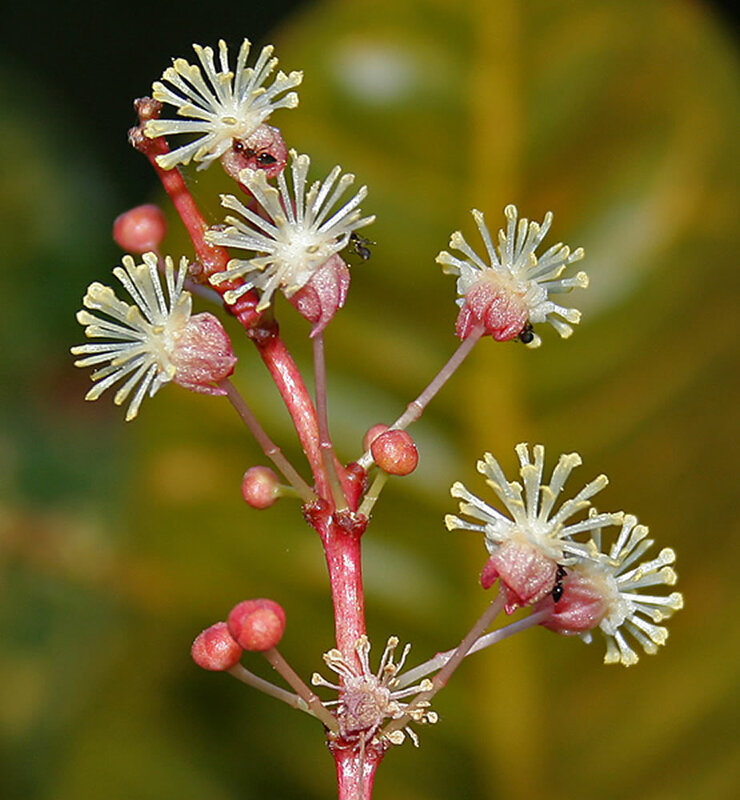 Distribution and habitat: Codiaeum variegatum occurs naturally in southern Asia, Indonesia and other Eastern Pacific islands where it grows in open forests and scrub. 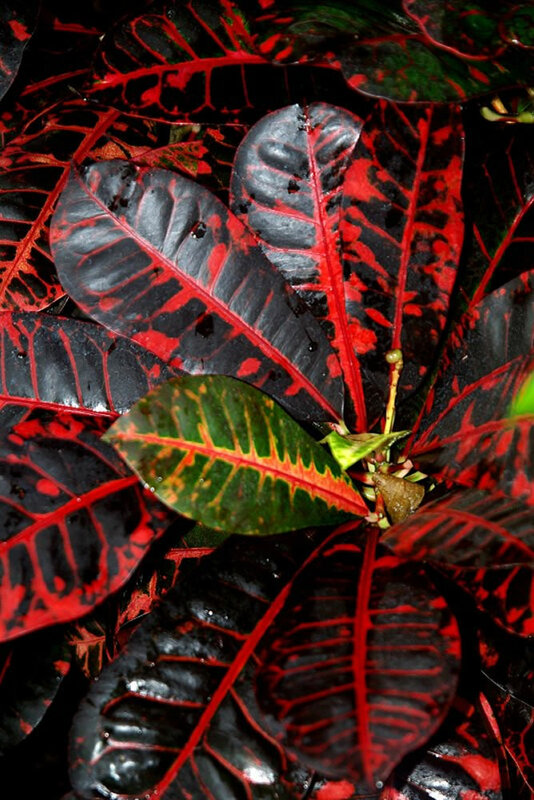 In the wild, Codiaeum variegatum is an evergreen shrub that grows to 3.1m (10 ft) tall and has large, leathery, shiny leaves. They are growing in open forests and scrub. The cultivated Codiaeum variegatum are usually smaller and come in an amazing diversity of leaf shapes and colors. Indoor plants usually grow to a height of 60cm (24 in) and grow slowly comparative with plants grown in a greenhouse. Greenhouse specimens can reach a height of 1.2-3m (4-10ft). 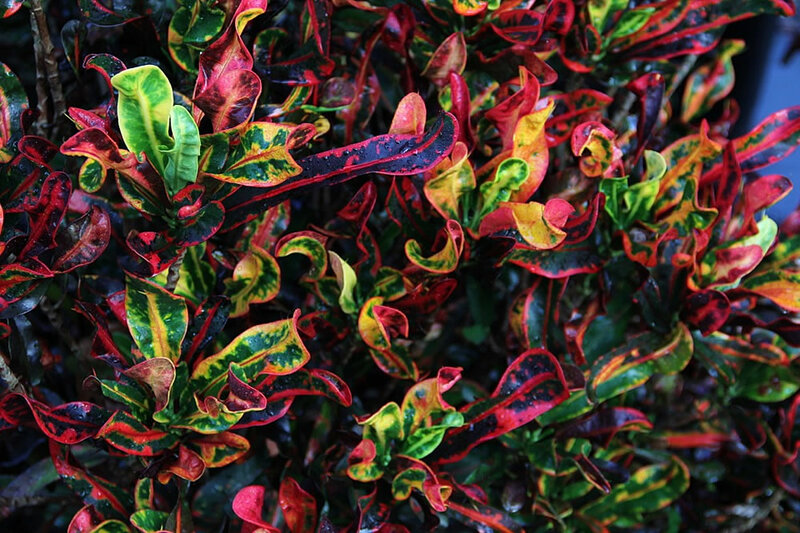 Codiaeum variegatum is noted for its bold, often strikingly foliage. Glossy, leathery, smoothed-edged leaves are in bright colors ranging from yellow, pink, orange, red, bronze, purple and green plus combinations thereof in patterns involving blotching and striping. Description: Codiaeum variegatum are much branching, bushy shrubs that seldom exceed 90cm in height with a spread of about 60cm, indoors. There are only few species of Codiaeum , though there are many varieties with widely varying leaf shape, size and colour. Practically all the kinds of Codiaeum now available are forms of just one variety of a single species, Codiaeum variegatum. 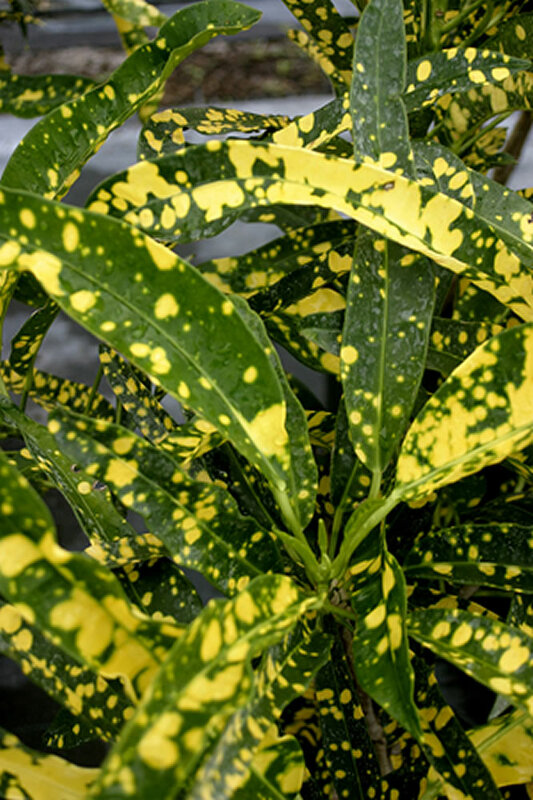 All available Codiaeum have variegated leaves with colours appearing as spots, blotches, veining etc. and the colours themselves are similarly variable. In some types old and young leaves look alike; in others the colours tend to change as they age. 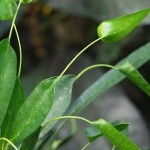 The smooth and leathery leaves generally have short stalks, but in almost all other respects the leaves can differ enormously. They may be long and narrow, lance or sword-shaped, broad and oval; they may have strait or undulate edges or they be twisted into a kind of spiral; their margins may be slightly indented in any one of a number of patterns or they may be cut almost to the midrib. Leaf size are not indicated because they are too variable. 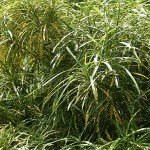 There are several hundred cultivars, selected and bred for their beautiful foliage. 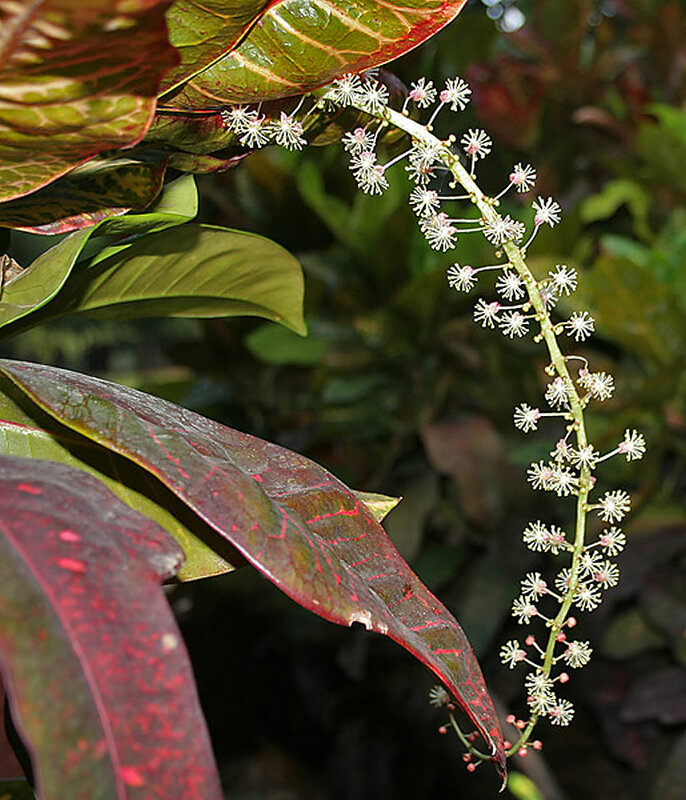 All these forms of the Codiaeum variegatum have in common following characteristics: thick evergreen alternate leaves, tiny inconspicuous star-shaped yellow flowers that hang down in long racemes and a milky sap that bleeds from cut stems. 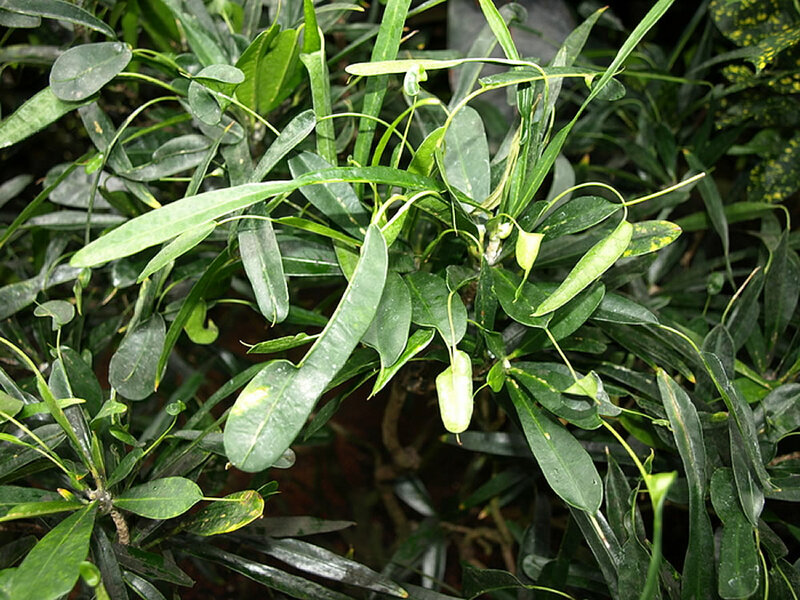 Depending on the cultivar, the leaves may be ovate to linear, entire to deeply lobed, and variegated with green, white, purple, orange, yellow, red or pink. The colors may follow the veins, the margins or they may be in blotches on the leaf. Codiaeum variegatum has long clusters of small inconspicuous white or yellow flowers. They are not even noticeable in house plants. 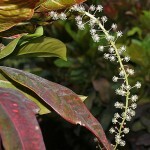 The interest for Codiaeum variegatum flowers is insignificant. 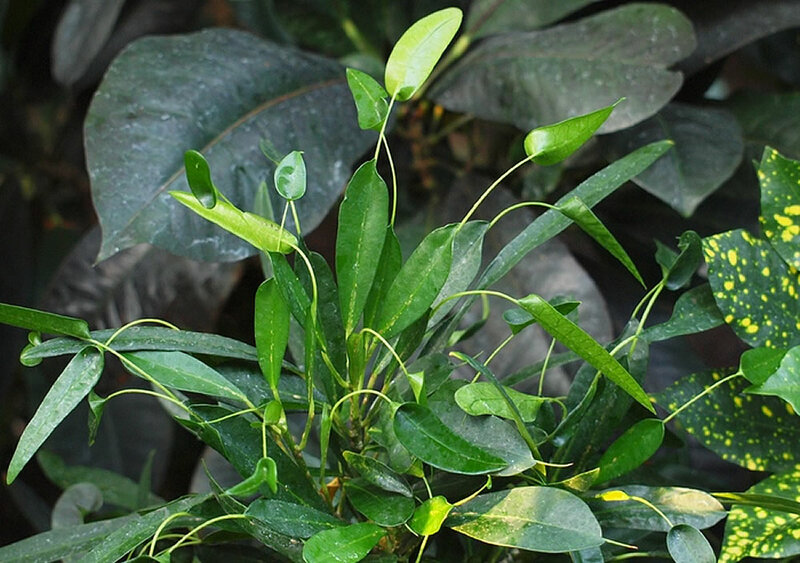 Houseplant care: Since Codiaeum variegatum normally branch out quite freely and become bushy without being cut back, pruning should not be necessary as long as a relatively large plant can be accommodated. 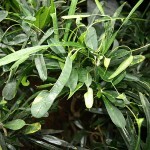 If a plant becomes too big for the available position, however, cut it back as much as required. The best time to do this is in early spring, before new growth begins. Spray cut ends with water or dust them with powdered charcoal to stop the flow of latex. Stems cut back will soon make new growth. Keep the leaves dust-free and shiny by wiping them with a damp cloth. Light: Bright light with at least two or three hours of direct sunlight daily is necessary for good colouration. 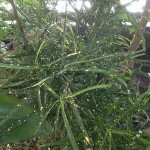 The normal leaf loss of older Codiaeum variegatum will be much increased in inadequate light. 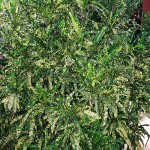 Temperature: Codiaeum variegatum grow well in normal room temperatures; do not let the temperature fall below 13°C (55°F). For adequate humidity stand the pots on trays of damp pebbles. Keep these plants protect them from drafts and severe fluctuations in temperature. Feeding: Apply to Codiaeum variegatum plants a liquid fertiliser about every two weeks from the begin of spring until late autumn. Potting and repotting: Use a soil based potting mixture. Move plants into pots one size larger each spring until the maximum convenient pot size – probably 20cm (8 inch) – is reached; thereafter, annual top dressing with fresh potting mixture suffices. Remove the top 5 to 8cm (2-3 inch) of soil and replace with fresh soil. Take care not to harm any roots that may be near the surface. 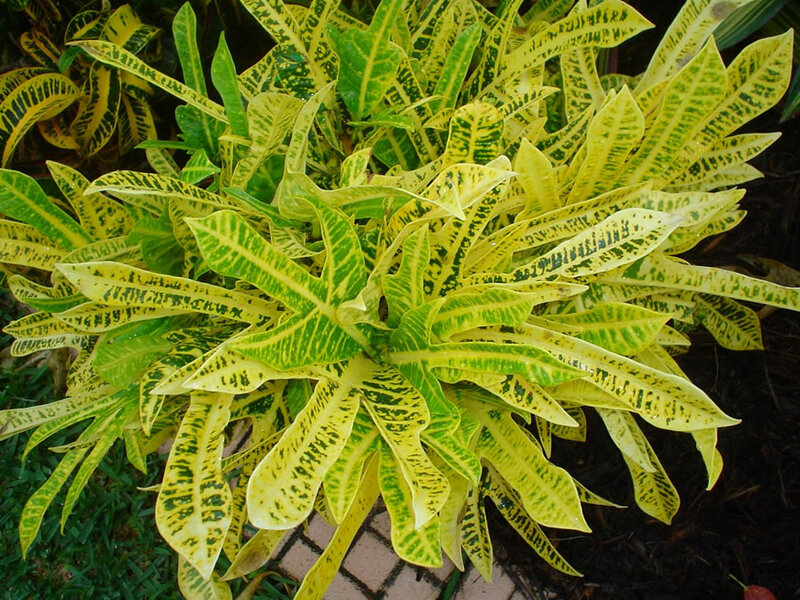 Gardening: It is quite a challenge to keep Codiaeum variegatum beautiful foliage plants healthy outside of the tropics or a greenhouse. Codiaeum variegatum need to be kept warm and humid in bright light to partial shade. 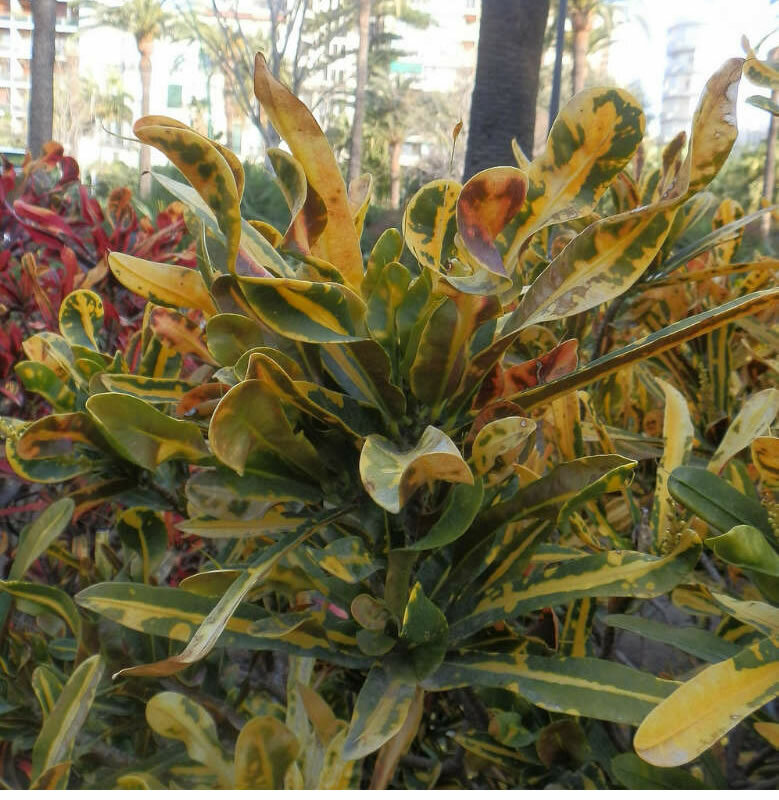 Codiaeum variegatum do best at temperatures between 15 and 30° C (60 and 85° F) and will die if temperatures stay below about 8ºC (46ºF) for very long. A winter temperature of 15°C (60°F) is ideal; it can withstand 10°C (50°F) but only for short periods. Never allow the temperature to rise or fall sharply; keep it steady. 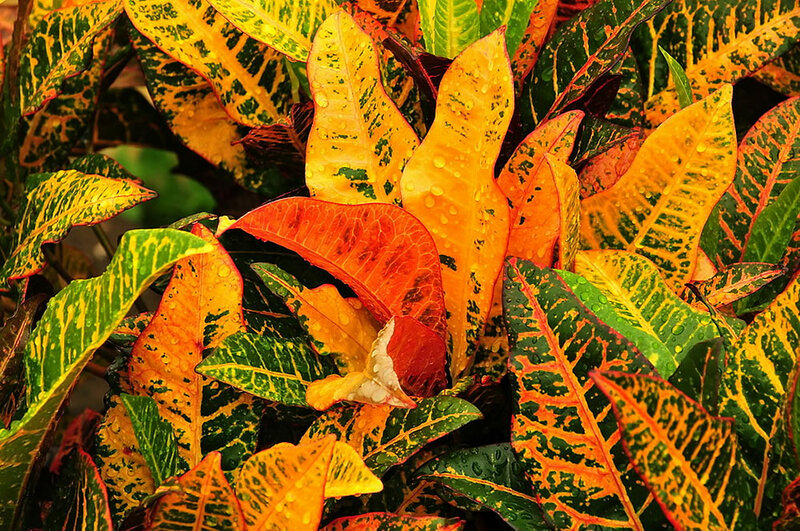 A well-grown Codiaeum variegatum will keep its leaves all the way to the soil level — and the trick to this is to provide steady warmth. Even in outdoor settings, Codiaeum variegatum will drop leaves after a cold night. However, these plants respond well to trimming. If a Codiaeum variegatum becomes leggy, prune it back hard at the beginning of the growing season, move it outside and the plant will regrow from the cut portion. Position: Outdoors, find a site in part shade or dappled sun. Codiaeum variegatum should be shaded from direct summer sun. Vibrant leaf colors depend on the quality of light. Do not shy away from providing lots of bright, shifting sunlight. 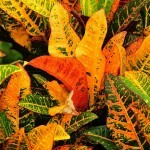 Codiaeum variegatum may lose lower leaves in too much shade. 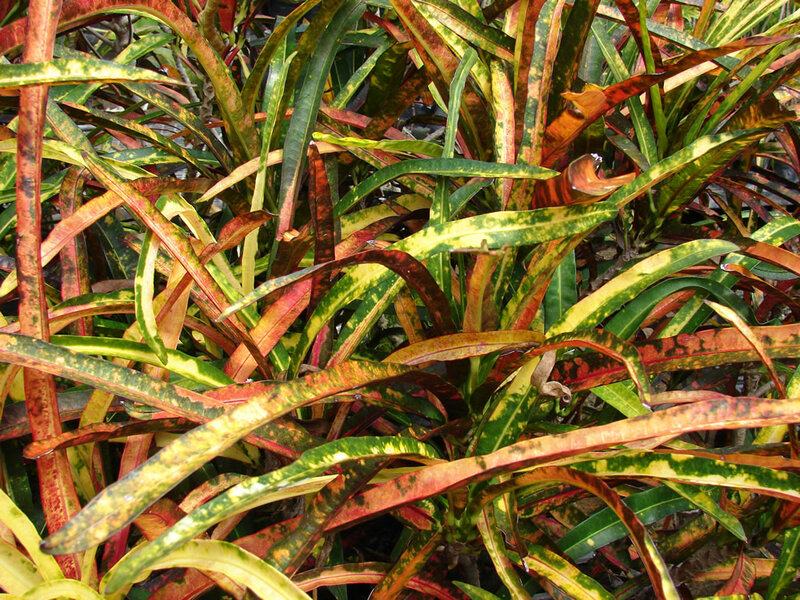 Soil: Codiaeum variegatum require moist, humus-rich, but well-drained soil. 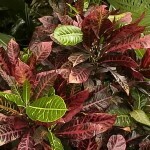 Grow Codiaeum variegatum in raised beds or in containers sunk into mulch beds during warm weather. Leaving them in containers eases the transition indoors where temperatures fall below 10°C (50°F), but the plants can also be lifted from their beds and potted in the fall. In either case, prepare a soil that drains well and is richly organic. 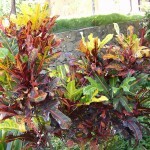 Codiaeum variegatum are not drought tolerant, nor can they stand wet feet or flooded conditions. Mulch raised bed plantings with 1 inch of organic material such as ground bark. Do not mulch potted Codiaeum variegatum. Repot them in spring if necessary. Irrigation: Proper watering practices will encourage healthy growth. Water the Codiaeum variegatum plant only when rainfall is less than 2.5cm (1 inch) for seven days during the active growing season. Soak the soil underneath the plant’s canopy and 30cm (12 inch) beyond its outer perimeter to a depth of 15cm (6 inch). Do not overwater to the point that the soil becomes soggy or develops standing water. Water the ground directly; avoid splashing the foliage as much as possible. Water the plant during the morning hours to allow moistened foliage time to dry before nightfall. Never let foliage remain wet overnight as this will encourage the formation of fungal diseases such as powdery mildew or leaf spot. 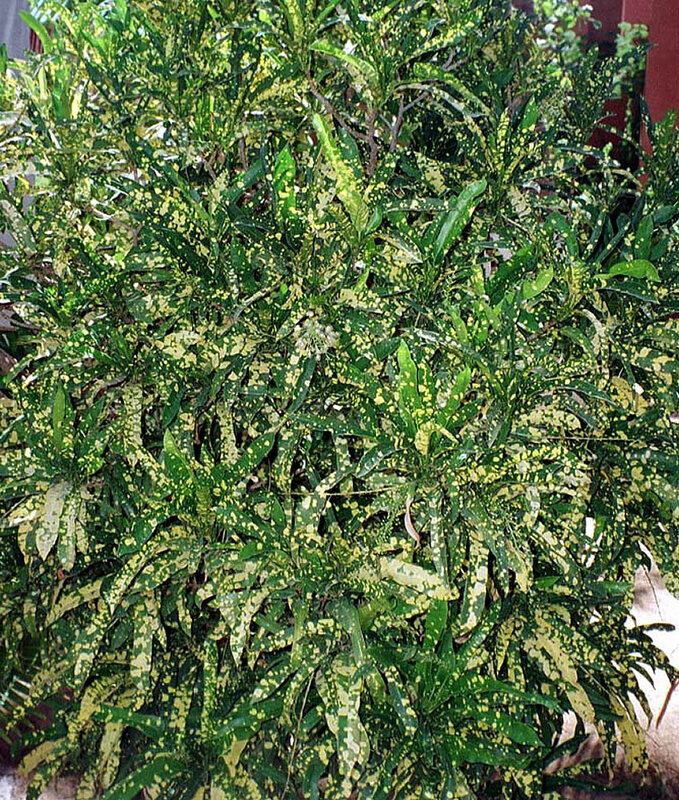 Reduce watering during the late fall and winter months when the Codiaeum variegatum growth slows. Water the plant when the top 2.5to 5cm (1-2 inch) of soil becomes dry. Codiaeum variegatum does not require winter dormancy, but appreciates a resting period with reduced watering from fall to late winter. Propagation: Propagate in early spring by means of 15cm long tip cuttings, preferably taken from side-shoots, which are likely to be smaller and less leafy than others. Take shoots 8-10cm (3-4in) long, with at least 2 pairs of leaves and a growing tip. 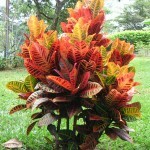 Codiaeum variegatum plants are filled with a milky latex which flows freely when stems are cut. Seal the cut end by wetting them or dip the cut end in powdered charcoal. Allow them to dry overnight in a cool area above 21ºC (70ºF) . Plant each cutting in a 8cm (3 inch) pot of a moistened equal-parts mixture of peat moss and coarse sand or a substance such as perlite. Enclose the whole in a plastic bag or heated propagating case and keep it in a bright light for four to six weeks. Maintain a temperature of 27°-29°C (80°-85°F) ideal. Thereafter, when fresh growth indicates that the rooting has occurred, treat the new plant as a mature Codiaeum variegatum. It will fill its pot with roots in six months and should be moved into a pot one size larger containing potting mixture for adult plants. Codiaeum variegatum may be propagated by air layering, but this method takes a great deal of time. They should develop roots in a month or two. Codiaeum variegatum sometimes produce “sports,” or shoots that are completely different from the parent plant. These can be potted up independently. 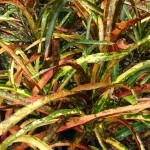 Codiaeum variegatum do not grow well from seed as the plant is unstable and the offspring will not resemble the parent. 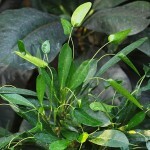 Only cuttings will produce a plant that is identical to the parent. Fine webbing under the leaves and at leaf axils is caused by red spider mite, which is encouraged by warm, dry conditions. Prevention: Frequent misting will help discourage them. Check your plant often, and if they appear, wipe the undersides of the leaves to clean them away. If they persist, use an insecticide. Woolly patches on the leaves are caused by mealy bugs. Treatment: Try to remove them with a cotton bud dipped in diluted methylated spirit. If this does not get rid of them, use an insecticide. 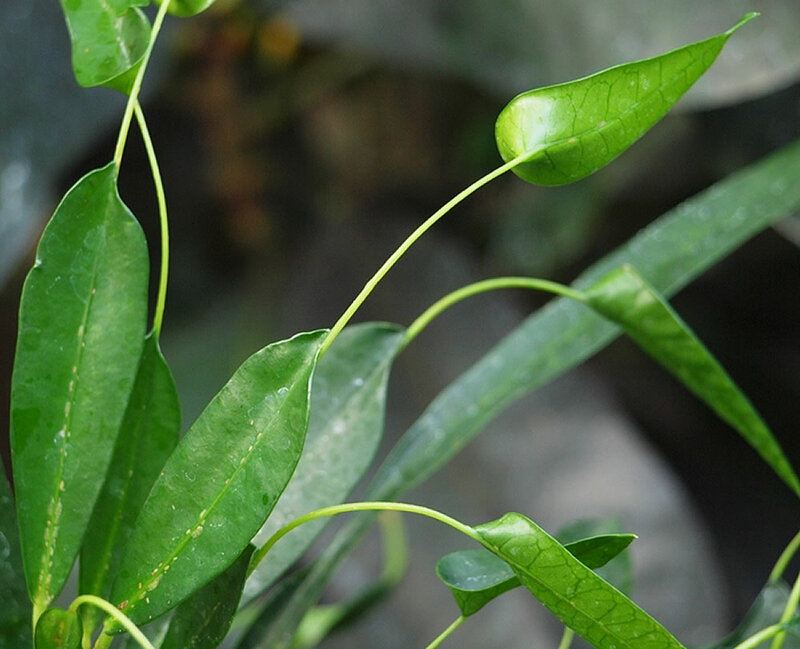 The leaves will become entirely green if the plant is in poor light. Treatment: Give more light. The leaves drop: Too much water, poor light and too dry an atmosphere can all cause the leaves to drop. In summer, mist the plant frequently with lukewarm water. Do this as early in the day as possible so the water on the leaves can evaporate before nightfall; this will help prevent fungus disease. Brown leaf tips or edges: The air is possibly too dry or the soil is dry if the tips are turning brown and your losing some of the lower leaves. If the edges are turning brown the temperature might be too low. Root rot could occur in poorly drained soil. 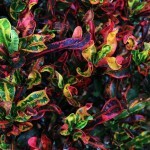 When to buy: Codiaeum variegatum is available throughout the year from garden centres and nurseries. It is best to buy your plant in summer when it will not be exposed to cold as you take it home. What to look for: Choose a plant with lots of leaves and good leaf colour. Avoid any that have dull leaves. Lifespan: Provided it has warmth, high humidity and care with overwintering, it will live for many years. Codiaeum variegatum f. appendiculatum is a curios form whose multicoloured leaves are interrupted in the middle and held together by the thread-like midrib only, which give the effect of two separate leaves held together by the midrib. Codiaeum variegatum f. angustifolium has elliptic, glossy leaves, which are coloured bright green with yellow spots. Codiaeum variegatum ‘Bravo’ is a showy shrub with large, oak leaf-shaped leaves with golden-yellow and rosy red veins which are in striking contrast to the dark green background of the leaves. Codiaeum variegatum ‘Bruxellense’ is a vigorous growing variety with broad, lance-shaped leaves, which are bronzish at first but eventually turn red, veins are yellow. 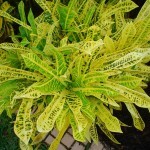 Codiaeum variegatum ‘Craigii’ has deep-cut, three-lobed, bright green leaves with prominent yellow veins. Codiaeum variegatum ‘Fascination’ has long, strap shaped leaves which are attractively coloured in unpredictable patterns and shades of green, red and orange. Codiaeum variegatum ‘Gloriosum superbum’ has broad, slightly undulate leaves that narrow down to a pointed lobe near the tip; the colour is green with yellow veins and margins, but the yellow deepens to golden orange as leaves age. Codiaeum variegatum ‘Imperials’ (Appleleaf) has elliptic leaves. The yellow leaf has roughly defined pink or red margins and a green midrib, both of which eventually turn deep metallic purple. 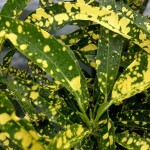 Codiaeum variegatum var.’punctatum aureum’ has long, narrow, glossy leaves which are dark green spotted with yellow. 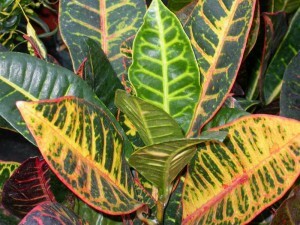 Codiaeum variegatum var. 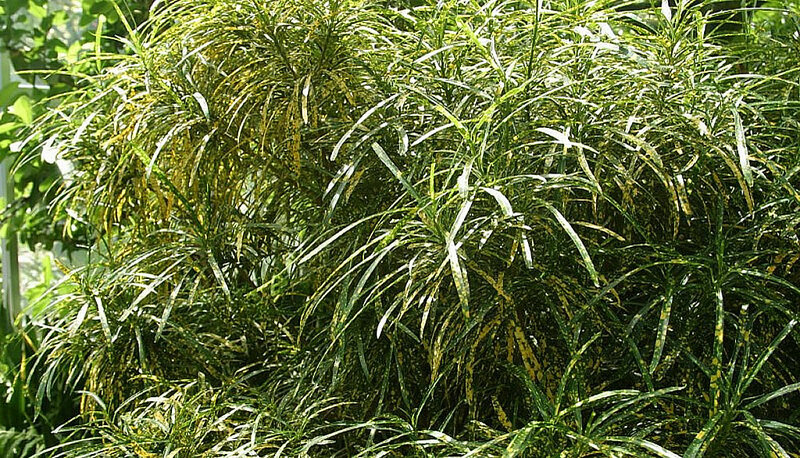 pictum ‘Reidii’ has oval oblog leaves, which are basically green, but the green is strongly tinged with yellow, pink and red and the prominent veins are coloured orange or red. 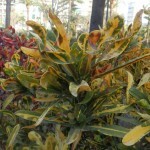 Codiaeum variegatum var. pictum ‘Spirale’ has narrow multicoloured leaves green, red and yellow in indefinable combinations, which are twisted like corkscrews. 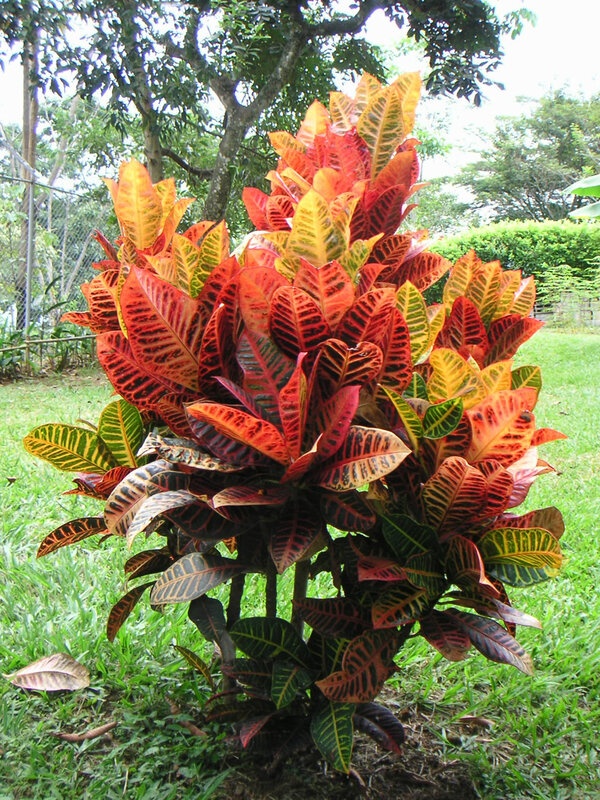 Note: The Codiaeum variegatum (garden crotons) should not be confused with Croton species, a cosmopolitan genus also in the Euphorbiaceae, containing more than 700 species of herbs, shrubs and trees. Toxicity: The milky sap of these plants can cause skin irritation. Wash hands if get in contact with the sap. 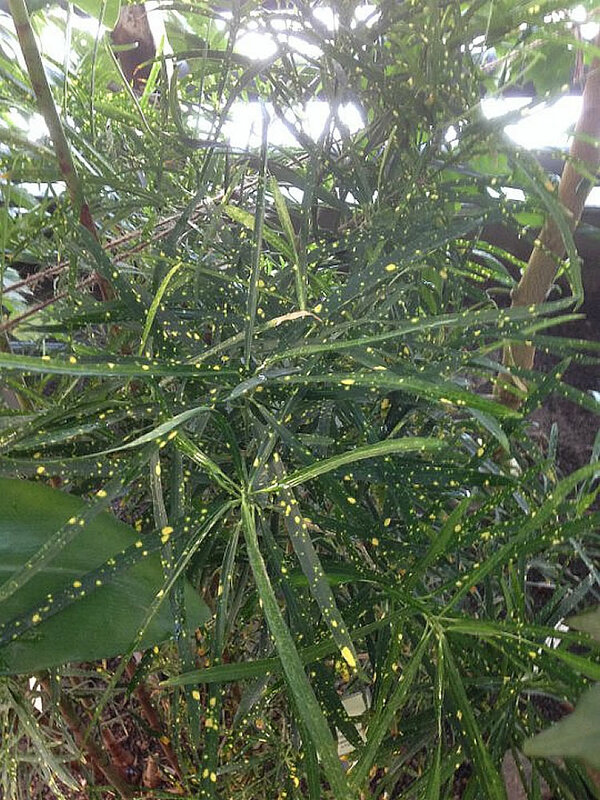 Avoid contact with eyes while handling Codiaeum variegatum plants. The whole plant is toxic if ingested by pets. Keep it away from children and pets and wear gloves while handling it. It is considered highly dangerous due to lack of symptoms and may cause inflammation and erosion of intestines, heart hemorrhage, liver and kidney function decline. 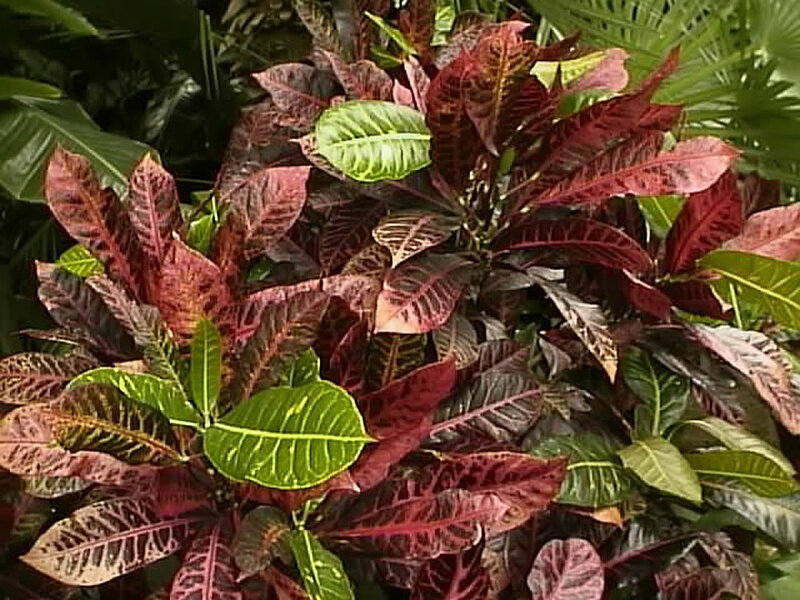 Uses and display: In tropical climates, Codiaeum variegatum make attractive hedges and potted patio specimens. 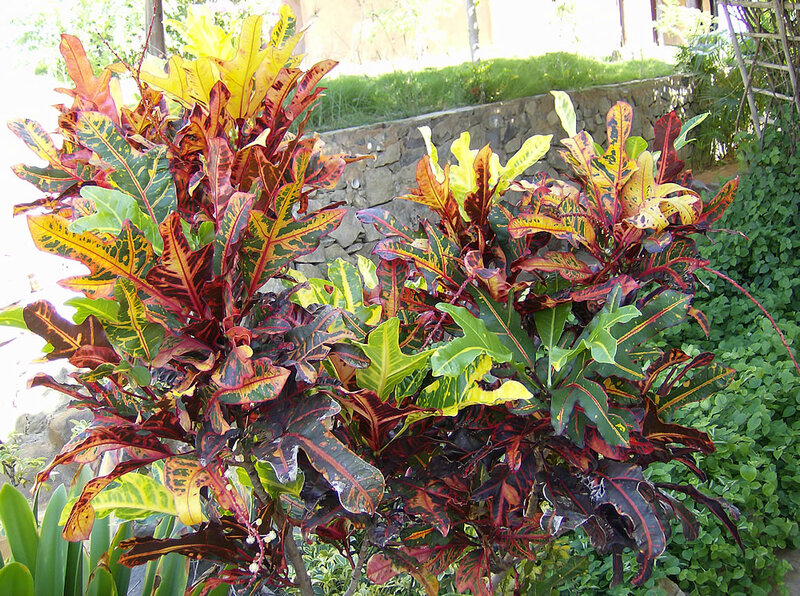 Elsewhere, Codiaeum variegatum are grown in greenhouses or as house plants, as an accent plant or a specimen plant, valued for their striking foliage. 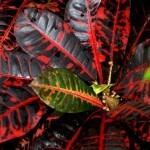 Its unusual leaves and colours add contrast to a group of plants. Codiaeum variegatum grows well in containers, being a popular, but quite difficult houseplant to grow. 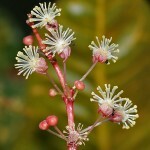 It is used as feature plant, foundation, hedges or mixed border in tropical landscape. The most difficult aspect of growing Codiaeum variegatum is in overwintering. It is best overwintered in a greenhouse where warmth and high levels of humidity can be maintained. Otherwise it will do well in a living room in a bright position, but you must keep the air around the plant moist.